If you are fond of okra, then you will find this delightfully simple recipe very useful. It is quick enough to prepare and just as quick to cook. It makes full use of the okra's versatility as a vegetable by blending it with coconut milk, the latter in itself remarkably versatile. The result is a dish that surprisingly highlights the sweetness of the okra that is not otherwise evident in other dishes for which it is used. Prepare the okra: Chop off both ends of the okra, slice into 2 or 3 pieces depending on the length. Place pork liempo and ½ cup of water in a pan or wok, bring to a boil and simmer until all the water has evaporated. Stir until the lard is drawn from the pork. /Set aside in one part of the pan or wok. Sauté garlic in the lard. Stir until golden brown. Add chopped red chili and stir for a minute or two. Stir the pork liempo back in. Add shrimp paste and stir for half a minute. Add the okra and stir for a couple of minutes. 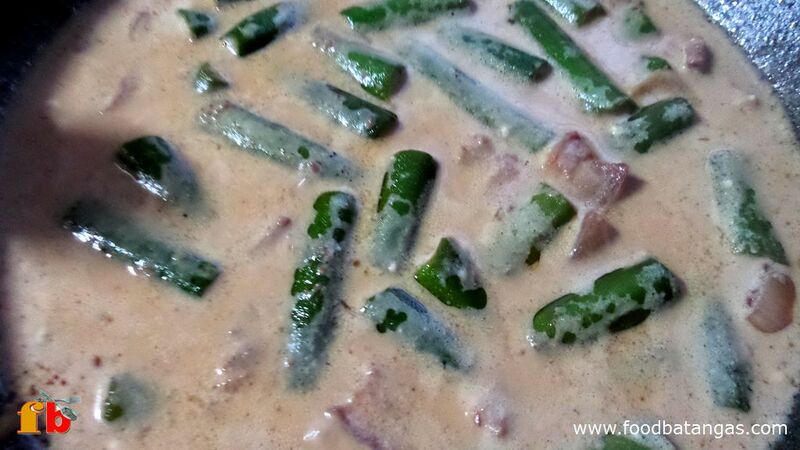 Add ½ cup of water, bring to a boil and simmer for 6-8 minutes or until the okra is tender. Add the coconut milk, bring to a boil and simmer for a minute or two.